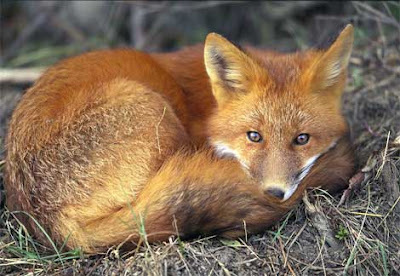 As you recall, the nice lad who collected the fox indicated that he would have it tested and let us know if it was positive for the rabies virus. No report so I though that it was not a rabid critter. WRONG! 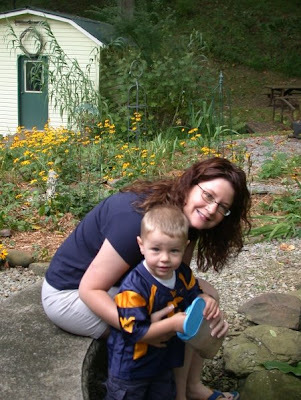 Got a call today from our friend, Jessica Shreve, who is now with the Gilmer County Health Department. Seems that she has just received a report from the lab that indicated it was a rabid fox. I remember when our good friend Teddy McDonald was in the earlier stages of Lou Gehrig's disease. His grandkids were visiting he and Phyllis at the Laneville house when a groundhog was acting funny. The kids ran into the house. Teddy took his shotgun out and saw the critter was chewing on the metal downspouts of the house. Not a good sign. The grounghog ran to the cars and started chewing on the tires of the car! Teddy pointed the gun at the groundhog which immediately ran toward him. He pulled the trigger and the gun misfired. 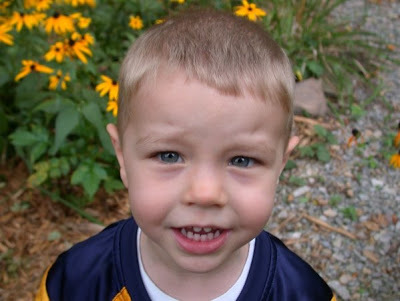 Because of his Lou Gehrig's disease, he stumbled and fell. He was able to hold the groundhog off by pressing his gun on its body. The beast was inches from his head. A relative in the house saw what was happening and grabbed a 45 caliber pistol and ran to Teddy's side. He shot the groundhog inches from Teddy's head. Teddy was lucky - the ground is very rocky and the bullet could have been deflected into his body. His ears were ringing for several days. 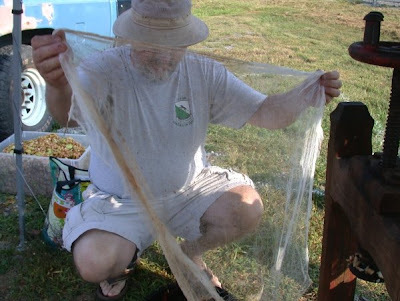 The DNR tested the grounghog for rabies and it came back also positive. Happy we did not have that type of story to relate! Top of the morning to you. Fall is here and the trees are beginning to shed their leaves. No big color change yet. We are a couple of weeks away from the prime color show that the deciduous trees provide. During some years the colors are truly dazzling. The hickory and walnuts by the house are starting to play war with the roof. In years when the nut production tis great (like this year), the nuts falling on our metal roof is quite a loud sound. I took these photos of a fungus growing beneath the feeder. These fungal fruiting bodies last just a few days and then they collapse into a black slimy clump. 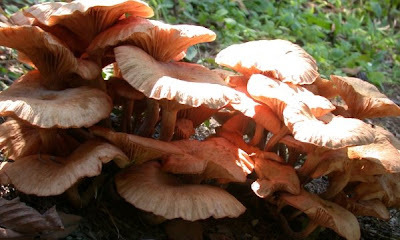 I do not know fungal species so I need help here. If you know this beast, leave a message. All I do know for certain is that we are NOT eating these critters. 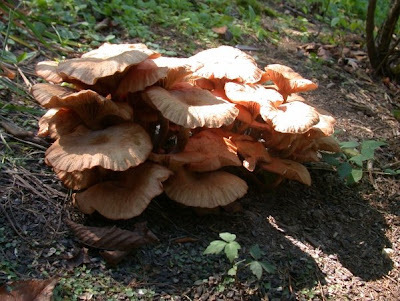 There are too many folks that have died an uncomfortable death by eating poisonous fungi. 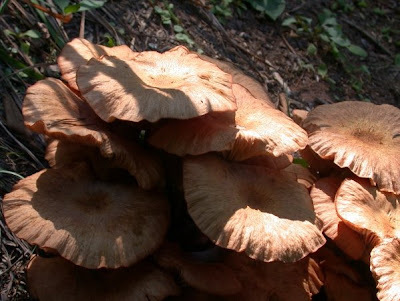 I love my liver too much to allow fungal toxins to enter and destroy its function. Liver transplants are not common surgeries and a surgery, I am certain, I would not enjoy! My idea is to enjoy the beauty of these critters and let the picking and eating to the experts. There are a few songs that bring me back to my childhood. My Mom was in the WAVES during World War II. She and Dad, who was in the NAVY, met and married in 1945. Mom loved the Big Bands of the 40's. 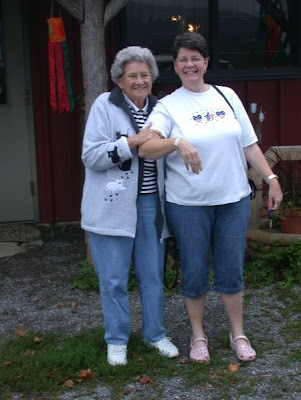 She remembers hearing Glenn Miller and his Glenn Miller Orchestra ("In the Mood", "Little Brown Jug", and "Chattanooga Choo Choo") and other famous orchestras of that era (Remember Les Brown and his Band of Renown?). Mom also loves the Andrews Sisters. Well, throughout my years with Mom, the one song that I remember her always playing on the piano was the Teresa Brewer hit, "Music, Music, Music!'. "Music! Music! Music!" was written by Stephen Weiss and Bernie Baum and published in 1949. The biggest-selling version of the song was recorded by Teresa Brewer on December 20, 1949 and released by London Records as catalog number 604. It became a number 1 hit and a million-seller in 1950. Welcome to my memories and listen to the original version of "Music, Music, Music". Since I am sharing music memories, I vividly recall the 45 rpm record that we had featuring the song "Sh-Boom". It is sometimes called "Life Could Be A Dream". This was first sung by The Chords and was their only hit. This song is often referred to as the first Doo-Wop song. Here is the version I remember on the old scratched 45 record. It was recorded by the The Crew Cuts in 1954. I know the songs of yesterday are much different of those that are often played today on all the newest recording technology. Funny, how one can actually heard the lyrics of the songs of the 40's and 50's! It is hard for Sarah and Jeff to celebrate Sarah's birthday with a little one who needs to be in bed early. They decided to go dancing using JibJab. Enjoy the post below! 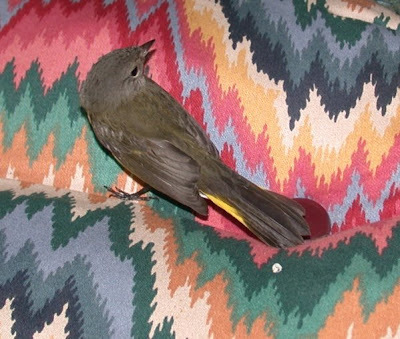 This little bird hit our window and, thankfully, as with past window hits, it was only disorientated and made a full recovery. I was not familar with this warbler-like bird. After searching my field guides, I went to my Fallen Timber nature expert. 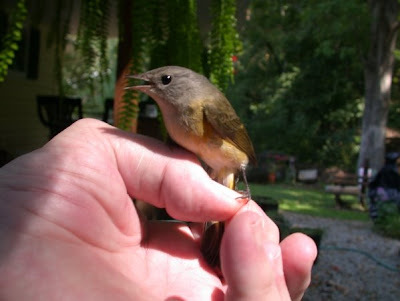 I shipped the photos to Diana by email and she discovered that this gal was a female American Redstart! 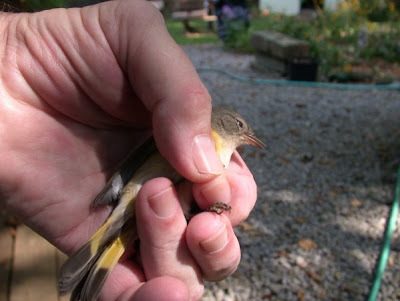 The female American Redstart is olive brown with yellow flash patches on the wings and tail. This is the recovery rocker on the back porch where many disoriented birds have recuperated. 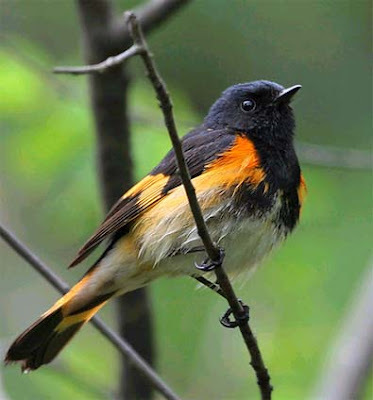 If it has been a male American Redstart then I may have identified it easier. The male is so different with black with bright orange patches on it's wings and tail. See below photo. 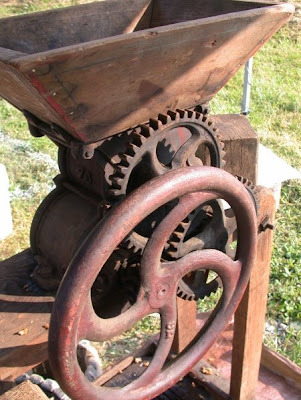 As you know I loved the market on Saturday with its working 1850's cider mill. Hugs go to the EDA for their efforts in starting this community service. You can tell that fall is here (started yesterday). 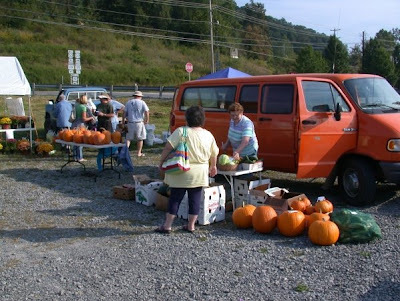 Burl Kimble and Judy are purchasing home ground corn meal from Ken Townsend. The Gilmer County honey bees have been active. 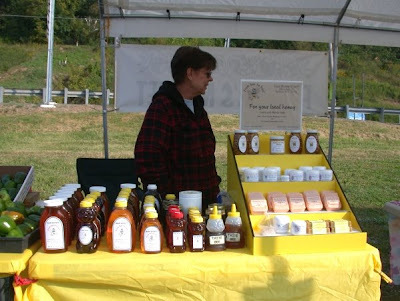 There are many opportunities to purchase locally produced honey. It is excellent. 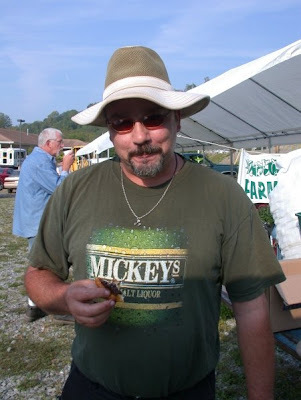 John Waddell is enjoying some gourmet delights. A great aspect of this market is that it brings our community together. What a neat time to visit with friends and also buy yummy produce! 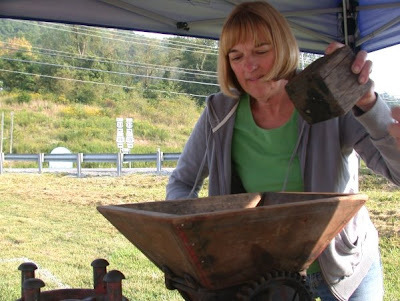 That Donna Waddell was still busy with the cider press. (See yesterday's blog.) Here she comes with more apples.! 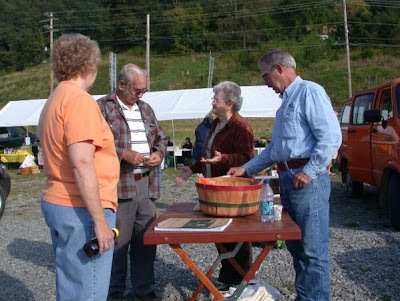 The Gilmer Historical Society was selling sassafras tea and other canned and baked goods. 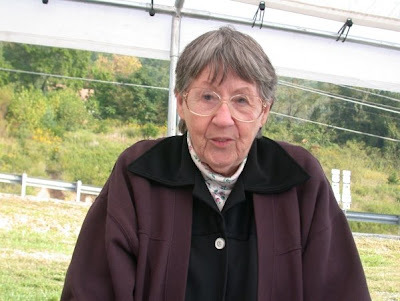 Margaret Moss is shown here tending the Historical Society's booth. 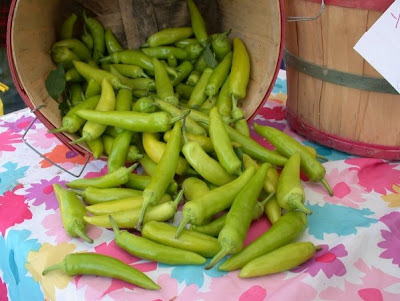 I got so into picture taking that I forgot to purchase peppers. Eat them raw- HOT! Stuff them with a meat mixture and bake - yummy with very little heat! 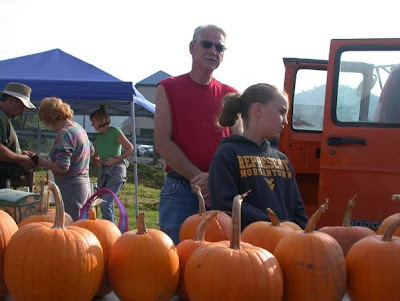 The pumpkins can only mean that fall has arrived! 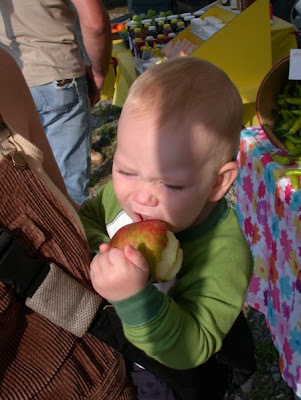 Even the little critters can plow through a whole apple. This gentleman was actively cooking peppers. 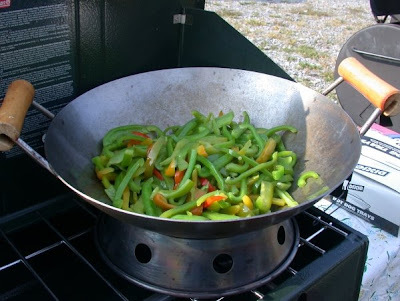 I believe the stir fry was going to be sausages with peppers and onions. We had to leave before the gourmet dish was finished. I will certainly check next week and see what the Farmers Market has again to offer. This past Saturday was a most special market. 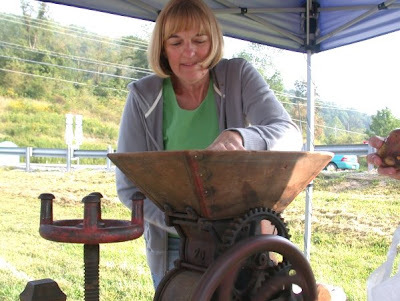 The team of Donna and John Waddell and friends put David Millard's 1850's cider mill into action. 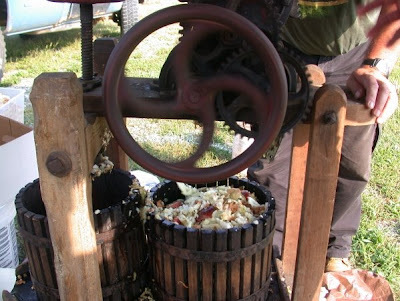 Apples were ground, pressed, and made into a most delicious taste of fall. 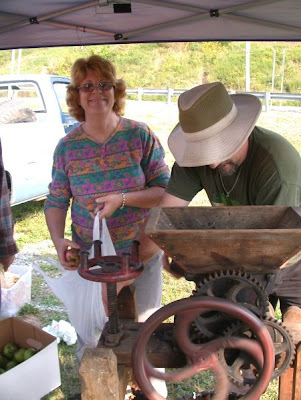 You will notice below how skillful Donna is in throwing the apples into the top chamber of the mill! 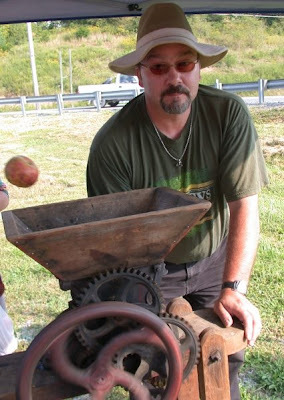 There is no fear in husband John's face because he knows she can place apples into the chamber easily at 20 paces! Donna and John had some expert helpers. Dan is preparing the cheese cloth. The smell of freshly ground apples was amazing. 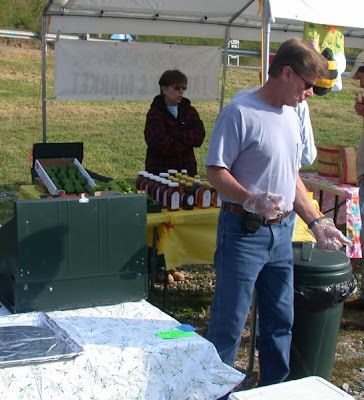 The cider mill experts distributed fresh juice to the crowd. Donna said she took home four gallons and canned it. 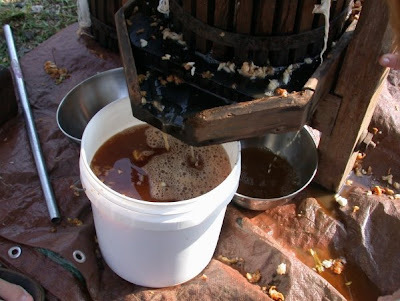 If you get some time next Saturday, stop by for a taste of the freshest cider possible! I have always been amazed at the microscopic sculptures of Willard Wigan. I am sharing this video that will give you an example of his wonderful and amazing work. Willard Wigan is the creator of the world's smallest sculptures, often taking months to complete one, working between heartbeats to avoid hand tremors. "You have to control the whole nervous system, you have to work between the heartbeat - the pulse of your finger can destroy the work." Wigan uses a tiny surgical blade to carve microscopic figures out of rice, and fragments of grains of sand and sugar, which are then mounted on pinheads. To paint his creations, he uses a hair plucked from a dead fly (the fly has to have died from natural causes, as he refuses to kill them for the sake of his art). His sculptures have included a Santa Claus and a copy of the FIFA World Cup trophy, both about 0.005mm (0.0002in) tall, and a boxing ring with Muhammad Ali figure which fits onto the head of a match. 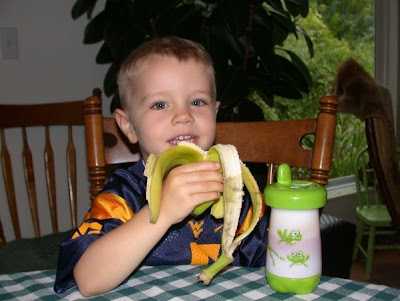 Wigan was inspired to do his work beginning at the age of 5. He is learning disabled, and doesn't know how to read or write. He said that his childhood teachers "made [him] feel small, made [him] feel like nothing." He decided to prove that "less is more," and that "nothing could be everything." Good good for him! I am saddened to think that his teachers did not make him feel important! In May 2007, Wigan's 70-piece collection was purchased by tennis player and businessman David Lloyd, who has insured the collection for a total value of £11.2 million. How To Peel An Egg Without Peeling! Cousin Sherel sent along this tip. Tim Ferris is demonstrating the technique of peeling eggs without peeling them. I tried it immediately. Grabbed 4 eggs, placed a few shakes of baking soda in the water, and boiled them for 12 minutes. Then the miracle of science is supposed to take over. This technique is not for the asthmatic during Easter! Question - Would anyone object to eating an egg peeled using this method? Do not do this until the eggs are cold! I tried and got "jaw ache" immediately. UPDATE: OK- went through all four eggs and failed miserably!! DANGER, Will Robinson! (Lost in Space - in every episode of the 1965-1968 TV show) Do not use this method- I ended up with sore jaws (like blowing up a new balloon) and slobbery eggs. If you really want to try this, I would advise purchasing an air compressor! Personally, I love the following technique. This method does not turn folks off when seeing how you removed the egg as in the first video - if, indeed, that method is possibe. This is a much more friendly and sanitary solution! 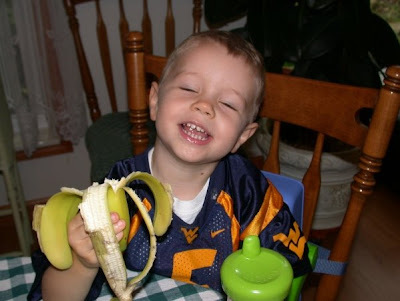 I realize that you all visit our blog just to learn these essential life skills. We thank you for visiting. Yep, I know that these proud grandparents are always bombarding you with stories and pictures of grandkids - Flora, Sam, and Lucy. I remember when we used to say about Sarah and Jeff that we only have granddogs from that union so far. Not true now with Sam on the scene - does it seem odd to you that Rudy and Georgia, the Golden Retrievers, have taken a back seat in the Dodson household? We have had dogs, but now are feline folks. My thoughts this morning went back to our Shepherdstown family. Rachael and John's neighbor at the time had the "ugliest cat in the world". The cat's name was Dexter. It was ancient, shriveled, scabby, almost toothless, drooled, and every time I would see this critter my thoughts were that it had escapd from a Stephen King novel! This was not a cat that one would want in your lap! 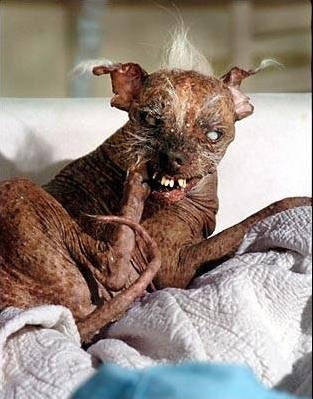 You all remember Sam (not grandson this time), the famous little pup that won the 2005 "World's Ugliest Dog Contest". This was Sam's third year winning the coveted title. I loved the description that was provided by the Associated Press in describing this little Chinese Crested Dog. The tiny dog has no hair, if you do not count the yellowish-white tuff coming from his head. His wrinkled brown skin is covered with splotches, a line of warts marches down his snout, his blind eyes are alien, milky white, and a fleshy flap of skin hangs from his withered neck. And there are the Auston Powers teeth that jut at odd angles. He is so ugly that the judges recoiled when they placed him on the table. Sam passed into doggie heaven in mid-November of 2005 of age related ailments. This dog made the internet circles, but if you happened to miss Sam - here he be! 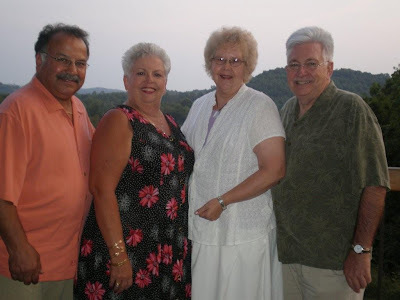 We were invited last month to dinner at Stonewall Jackson Resort by our friends, Kuzem and Sondra Nasseri. The date was August 20th. On that day Kazem and Sondra celebrated their 30th wedding anniversary. We have been married just a little longer - 41 years. I was Kazem's best man at their wedding. They are, indeed, a special couple in our lives. 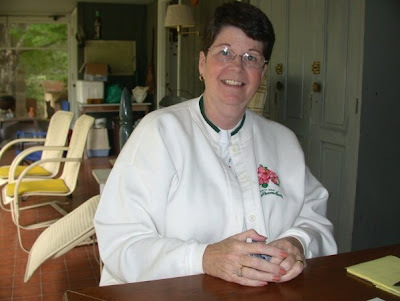 Sondra worked as our secretary in the 1970's at GSC. She is the one who kept things straight. I do not know how we continued to function after she left to move to the Clarksburg area. Sondra was the one with eyes for detail. "Jim. do you realize that you have two colors of socks on today!" Kazem is a hard-working and gentle man. He and Sondra are those type of folks that would help you in any way possible. 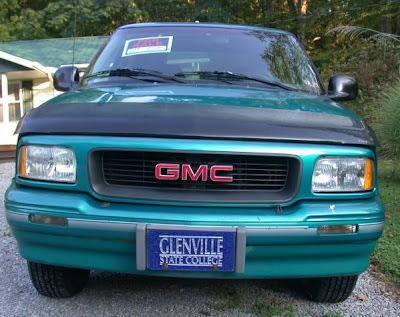 As you can see our 1994 GMC Sonoma truck with 65,000 actual miles was for sale. 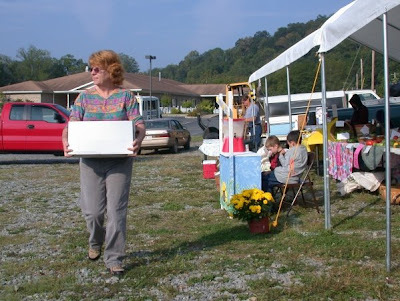 While I was in Seebert with sister Judy and Mom, the good wife made the signs and sold the vehicle within a couple of days. I think that we put only 20,000 miles on it in the ten years that we owned it. 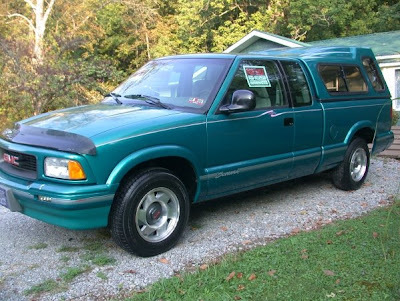 My friends always made jokes about my teal truck with pink stripes! We drove it locally to haul mulch (not often) and go when our 1999 Voyager van was in the shop. The 1999 Voyager is now at the doctor's getting the deer damage repaired. Think it should be finished sometime next week. 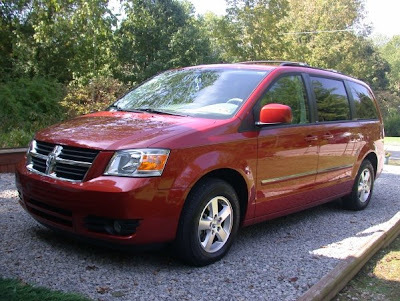 It has now 182,000 miles on it and we did not even consider for a moment selling this van. It has been an amazing vehicle. My theory is that preventive maintenance is the key to keeping a vehicle healthy. Yep, oil is changed ever 3000 miles. 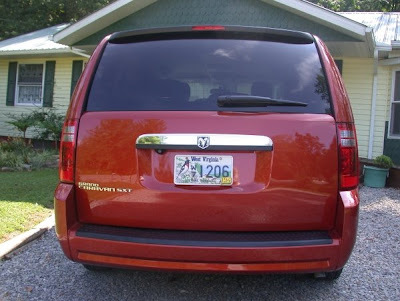 On Monday we said "Hello" to a new 2008 Grand Caravan. 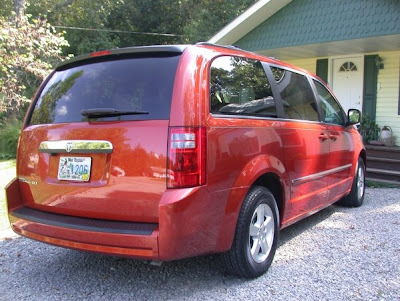 This critter has all the perks - stow-and-go leather seats with heaters front and rear, back-up camera system, Sirrus radio system, automatic doors and hatch, etc. I have to start reading the book so I will learn which button to push! 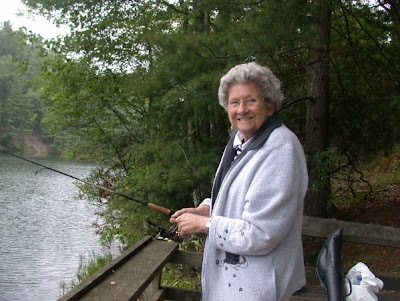 Another Fishing Trip With Mom! 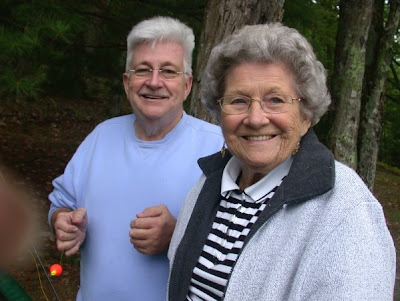 This Tuesday through Thursday was another adventure with our 84 year old Mom. Sister Judy, Mom, and I stayed at the Seebert Hilton. We are so blessed to be able to have Mom healthy and enjoying life. Pix and Dan's house has a wonderful screened in porch. 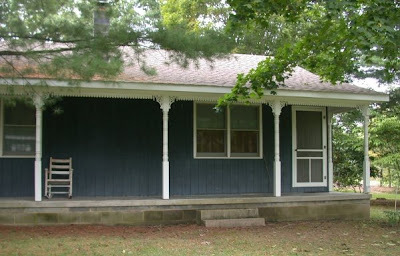 This was the site of most of our canasta tournaments. 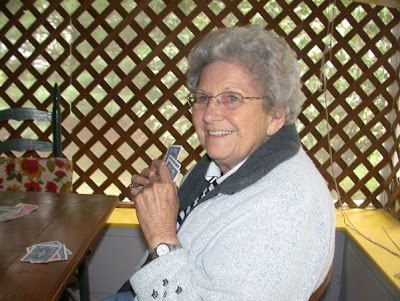 We did play a couple games of ten penny rummy, but canasta is Mom's all time favorite card game. 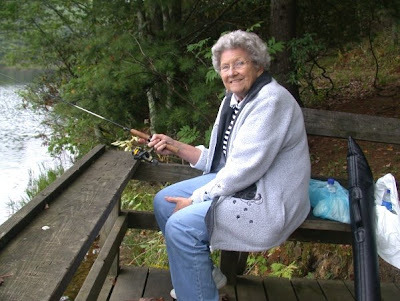 Wednesday evening we went to Watoga Lake and Mom was eager to catch "THE BIG ONE". 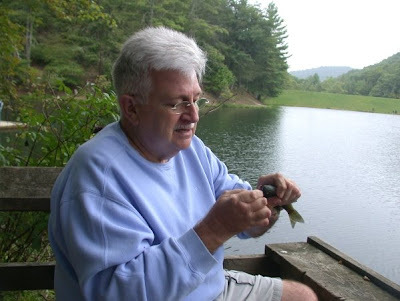 Pix and Dan have a needlepoint on the living room wall that says - God give me strength to catch a fish, So big that even I, When telling of it afterwards, Have no need to lie. I keep that fisherman's prayer in mind when I am throwing out my line. I caught a few small bluegills and bass. I did hook a VERY LARGE bass! (Must have been 21 inches - what about that prayer I mentioned?) It was large, and I am not used to tackling a large fish these days with my ultra-light pole with 7 pound test line. The ole pole was bending and straining- I tried to manhandle it and I did not play him so he would loose energy. I reeled hard - SNAP- the line broke! Only good thing was that if I had successfully landed the bass - you know Mom would make us clean it and fix it for her breakfast! Before we left the valley, we stopped by Miss Diller's craft shop. 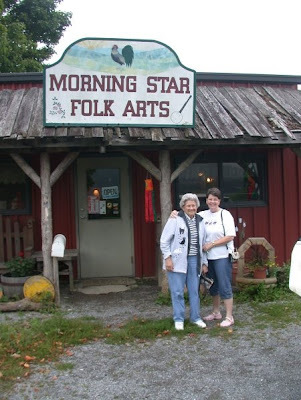 She is a sweet lady and has interesting items in her shop. What a great time to be able to share this experience! Retirement is good! Sarah and Sammy visited us on Saturday. 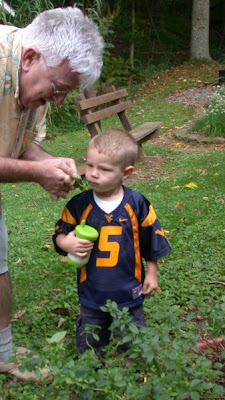 Dad Jeff was on the way to Greenville, NC, to watch the WVU and East Carolina football game. They were playing at four o'clock on Saturday. 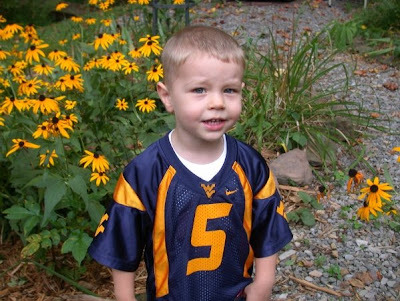 WVU did awful with the final score being East Carolina 24 and WVU 3!! Poor Jeff and his friend, Chris, did not make it home until around 3 A.M. on Sunday. Sam loves to feed the koi in the pond. We think it is great to watch this kid when he sees the big catfish approach him. Grandpa decided that he and Sam needed to go on a safari to collect critters. It has been so dry that beasts were difficult to locate. Hurray! One stupid earthworm was finally located. 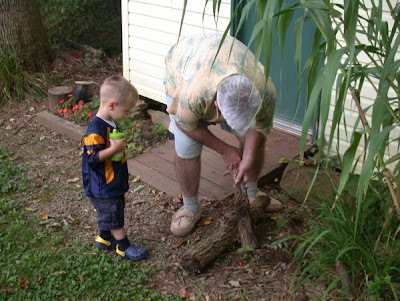 Grandpa gave Sam a lecture on the biology and ecology of Lumbricus (genus of earthworms). He was sooooo attentive. Sam is a fast learner. He now knows the wonders of worms so, when he starts preschool, he will startle the teacher with his knowledge of these segmented critters! Worm hunting really makes a guy hungry! It was a great visit! Thanks for sharing.